The regenerative capacities of the hermaphroditic biotype of the planarian Schmidtea mediterranea allowed us to study Mendelian segregation and loss of heterozygosity in the genetically understudied Spiralian superclade in general, and flatworms in particular. We discovered that ~300 Mb (~37.5%) of the 800 Mb genome of the sexually reproducing S. mediterranea retains heterozygosity even after ten generations of inbreeding. Our research opens the door to study the evolutionary basis of non-Mendelian mechanisms and their potential relationship to the robust regenerative capacities of planarians. More often than not, it is hard to know with certainty when a story truly begins. 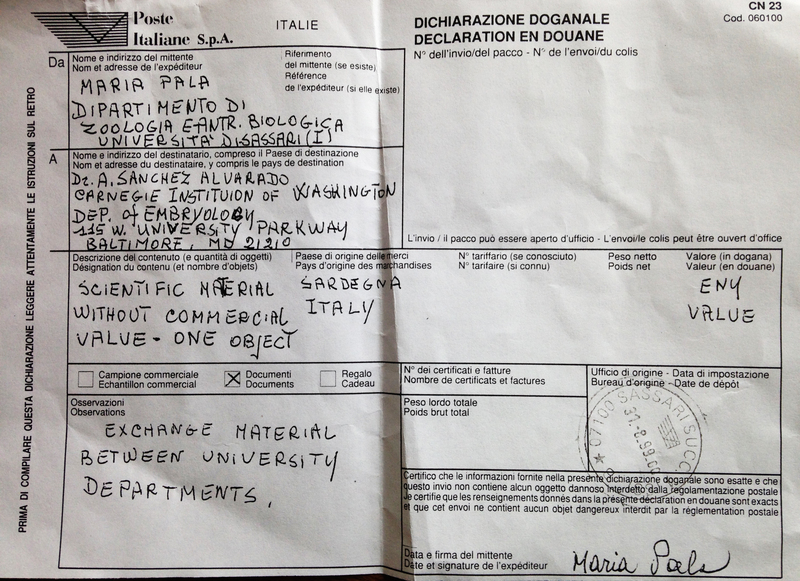 For now, let’s just say that our story began in the early fall of 1999 with the arrival of a package sent to us by Dr. Maria Pala from the University of Sassari in Sardinia (Figure 1) . Neatly and securely placed inside this package was a canteen not too dissimilar from those used by explorers or Boy Scouts. The canteen, which was filled with water, somehow had frozen during transit. Sandwiched within the space that formed between the icy core and the walls of the canteen, however, we found what we had requested and so anxiously were waiting for: a remarkably alive and small collection of about 50 or so hermaphroditic Schmidtea mediterranea worms. Phil Newmark (then a postdoctoral scientist in my laboratory) and I harbored a hope to develop this hermaphroditic biotype into a genetic model system to study regeneration, but being the novices we were, failed after two years or so to make these animals reproduce robustly in captivity. Figure 1 | August 31st, 1999 shipping manifest of the sexual Schmidtea mediterranea sent to us from Sardinia by Dr. Maria Pala. These animals were used to establish our laboratory colony. In December of 2001, we moved our laboratory from the Carnegie Institution Department of Embryology in Baltimore, Maryland to the University of Utah School of Medicine in Salt Lake City, Utah. The worms, of course, made the trek west with the rest of us, and they appeared to love their new environs because they began to lay egg capsules in numbers we had never seen before. In fact, Nestor Oviedo who at the time was a graduate student in my lab, initially thought that our colony had been contaminated as he, like most everyone else in the lab, had never seen egg capsules before. Enough capsules were laid and with enough embryos in them that it became possible for me to collect, describe, label and begin to study planarian embryogenesis . Yet, such production was erratic at best. It was not until the arrival of Longhua Guo as a graduate student to my lab in 2008 that methodical and systematic observations and culture methods began to be tested in order to consistently drive the sexual reproduction in captivity of this hermaphroditic animal. Long set out to generate an inbred line to facilitate genetic analyses and during this time, we moved from Utah to the Stowers Institute for Medical Research in Kansas City, Missouri. Long’s ten-generation inbreeding experiment was the first such effort for this species, and possibly for flatworms. Long’s work was greatly facilitated by the Stowers Institute, which dedicated resources to establish a Planarian Core Facility, allowing us to maintain and track all generations and their respective individual progeny (Figure 2). Figure 2 | Closed circulation and single unit housing apparatus being used to raise the sexually reproducing S. mediterranea. Top left and right show the system about to be populated by animals. Each tank partition has within 12 cylinders in which animals will reside. Bottom movies show the system in action. The time lapse on the left shows the rate of flooding and flowing of the water, while the movie on the right shows animals feeding. Both movies were shot by members of the Stowers Planaria Core facility. As we contemplated the resulting inbreeding pedigree we realized that planarians opened new opportunities to ask genetic questions not readily accessible in other, better established and more traditional invertebrate model systems like flies and nematodes. First, we started from a single worm which was amputated into two fragments, which were allowed to regenerate, and then were reared to sexual maturity, with the resulting clones being crossed to each other. Second, planarians are remarkably long-lived animals. What that means in practical terms is that unlike other systems in which only two, maybe three generations can co-exist within a population, here we have a population in which ALL 10 generations co-exist and can cross with each other. In other words, it is possible to cross a great-, great-, great-, great-, great- grandparent directly with its great-, great-, great-, great-, great- grandchild. The implication is obvious: if this is possible in the lab, it is likely occurring in wild populations. This type of intergenerational genetics, therefore, must have important consequences on the genetic makeup of any given population, particularly if those populations are not large and/or are geographically isolated. Armed with animals that had been inbred for ten generations, we proceeded with retrospective large-scale Single Nucleotide Polymorphism (SNP) analyses. We initially sequenced the transcriptomes and later the genomes of the founder animal and its descendants to identify sequence-rich, unambiguous, heterozygous SNPs. Then, we clipped the tails of animals (which always regenerated without fail) from different generations, and followed the fate of the nearly 31,000 heterozygous SNPs identified. We anticipated that the animals would have reached nearly complete homozygosity by the fourth inbreeding cross as predicted by the Hardy-Weinberg principle. However, we were surprised to find that while many SNPs followed Mendelian inheritance and ultimately reached homozygosity, many others behaved in a non-Mendelian fashion, retaining their heterozygosity even after multiple rounds of inbreeding (Figure 3). Figure 3 | Persistence of heterozygosity in the planarian S. mediterranea. After amputation of a single animal into two (F4-26), allowing the fragments to regenerate and then crossing the resulting clones to each other, we followed the fate of heterozygotic alleles (T/G in these cases) in the resulting progeny (F5s). Shown are two independent alleles for which the expected Mendelian segregation of 1:2:1 for heterozygotic alleles was obtained. We refer to these alleles Mendelian-inherited SNPs or MI SNPs for short. Below, are three independent loci for which only heterozygote progeny could be recovered (loci 1773, 2739 and 6712). We refer to these alleles as Non-Mendelian-inherited SNPs (Non-MI SNPs). Yet, it was the extent of the persistence of heterozygosity which took us aback. Of the more than 30,000 SNPs analyzed, nearly 14,000 behaved in a non-Mendelian fashion. Even more surprising was the fact that when we mapped the Mendelian (MI) and non-mendelian (non-MI) inherited alleles to the 800 Mb S. mediterranea genome, their respective distributions suggested that ~150 Mb (~18.7%) of the genome followed Mendelian inheritance, while ~300 Mb (~37.5%) of the genome did not get Mendel's memo and retained heterozygosity. Because these worms have been reared in captivity for nearly 17 years, it is possible that the observed persistence of heterozygosity may have been artificially introduced during laboratory culture. In order to determine whether or not we were studying an artificially selected artifact, we needed to sample the genomes of wild type animals. Given that we had never seen the natural habitat of the sexual S. mediterranea, the time had come to leave the confines of our laboratories, turn the tables and bring science to nature instead. So we chose to take a trip to Sardinia (Figure 4). Figure 4 | The island of Sardinia is home to many species and subspecies of endemic organisms. 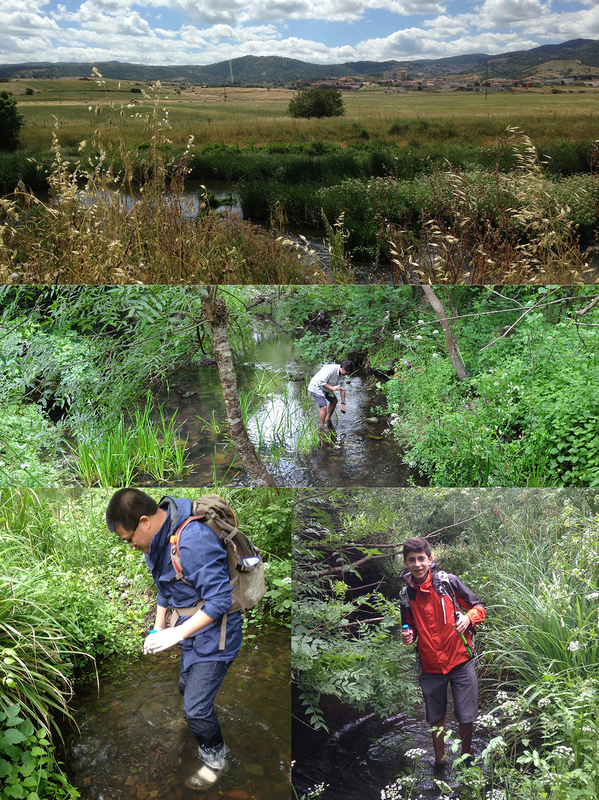 Prospecting waters for diploid specimens of the hermaphrodytic, sexually reproducing S. mediterranea. Myself, Longhua, and our field assistant Sebastian Sánchez-Piotrowski are pictured. We designed SNPtype dynamic arrays containing 82 SNPs (11 MI SNPs, 71 non-MI SNPs) and used them to genotype 12 individuals from three geographically distant locations in the island. 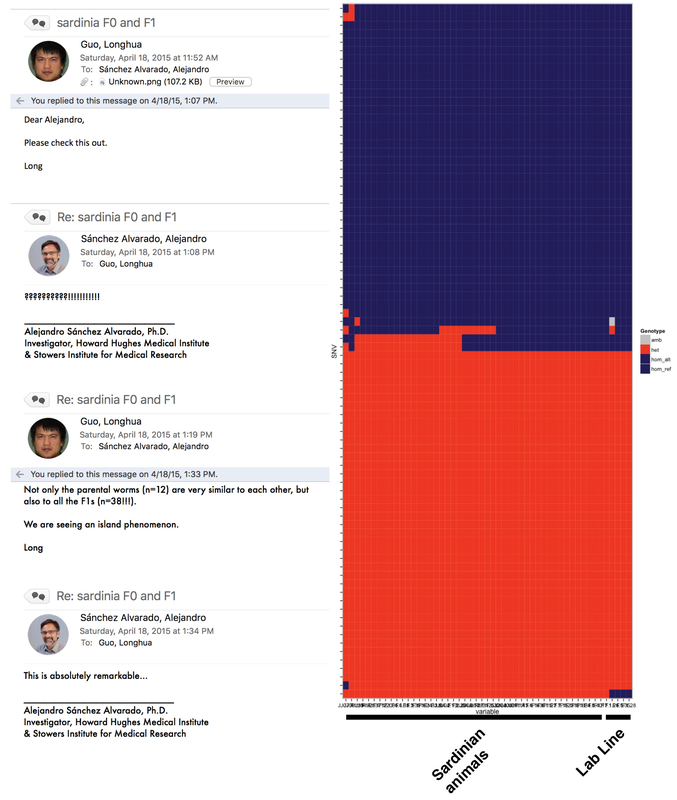 When Long shared the data with me via e-mail, I thought at first that I was looking at controls (Figure 5). However, upon close examination I realized that the samples on the left side of the horizontal axis were all field-collected specimens. The diversity in these wild animals came primarily from two MI SNPs and one non-MI SNP. I could not hide my astonishment (Figure 5), as I was expecting much more genetically diverse wild type populations. Figure 5 | E-mail correspondence over the first genotyping results of wild-caught Sardinian sexual S. mediterranea. The horizontal axis indicates individual samples tested, while the vertical axis measures a total of 82 SNPs (11 MI SNPs, 71 non-MI SNPs). Red color indicates heterozygosity, blues indicate the reference or alternate homozygous allele, while grey indicates SNPs that could not be resolved unambiguously. The question of course is: how is this possible? How is loss of heterozygosity prevented during inbreeding in S. mediterranea? We experimentally ruled out the most likely possibilities, i.e., embryonic lethality, oocyte non-disjunction and balanced lethality . Nevertheless, a distinct possibility remained: perhaps the persistence of heterozygosity was a consequence of genome duplication (Figure 6). Imagine a duplicated heterozygote allele (Aa) in a diploid genome (Figure 6, top left). If two animals with the same duplication are crossed, Medelian-inherited alleles will segregate into the expected1:2:1 ratio (Figure 6, top left). However, a duplicated pair of homozygous alleles (AA and aa) would still segregate in a Mendelian fashion, but the resulting genotype would be 100% heterozygote giving the impression of non-Mendelian segregation being at work (Figure 6, top middle ). One way to resolve this matter unambigupusly is to sequence the haploid genome of male and female gametes. If the alleles are duplicated, they would show up as heterozygotes in the sequence reads. If they are not, either one allele or the other, but not both, would be found in the resulting DNA sequencing data (Figure 6, bottom left). Figure 6 | Testing genome duplications in S. mediterranea and the discovery of the J and V haplotypes. On the left are the expected genotype results for both Mendelianan and non-Mendelian alleles after inbreeding (top), and the expected allele distribution of duplicated and non-duplicated alleles in haploid genomes. On the right are the allele calls for non-MI SNPs in the sequenced haploid genomes of 26 different gametes isolated from the founder animals. The comparatively small representation of red events overall indicates that a wholesale duplication of the planarian genome has not occurred, and that the gametes cluster into two haplotypes termed J and V (see text for explanation). So, Longhua set out to develop and optimize methods that would allow us to isolate individual gametes (male and female) from genotyped individuals, purify, amplify and sequence their haploid DNA. Whole-genome sequencing of 11 individual spermatozoids and 15 individual oocytes from the founder animal revealed minute amounts of heterozygosity varying from gamete to gamete (Figure 6, right side, red events). 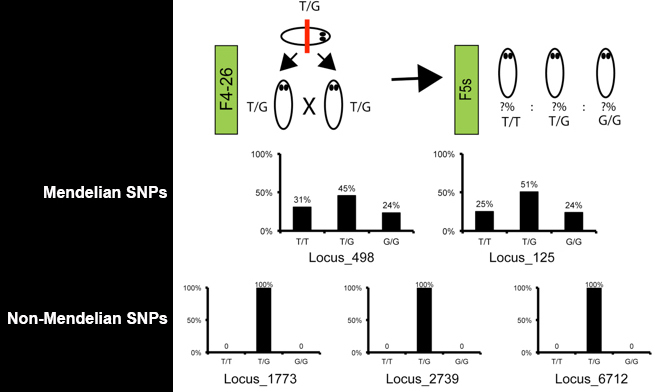 These results demonstrated that a basal level of gene duplication exists on different chromosomes, but not whole genome duplication. 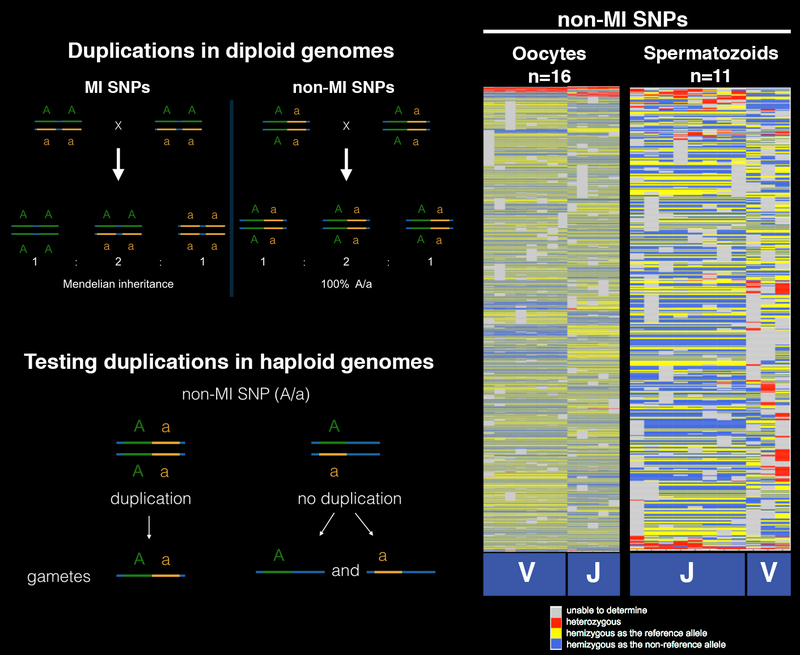 What we did not anticipate was to find that both male and female gametes had lower diversity at the non-MI SNPs compared with the MI-SNPs. While at the MI-SNPs, gametes were more diverse , the non-MI SNPs clustered into two groups (Figure 6, right side, V and J columns). We named the two groups of allele combinations in male and female gametes J and V haplotypes to honor the very important contribution to our science by Mr. and Mrs. Jim and Virginia Stowers. Overall, what started as an effort to produce isogenic lines to initiate traditional genetic screens, progressively turned into an exploration of genetics in a group of animals (the Lophotrochozoa/Spiralia) for which little to nothing is known with regards to their mechanisms of inheritance. As a general implication of our findings, we propose that for long-lived organisms, mechanisms capable of mitigating loss of heterozygosity and therefore maintaining high rates of genome heterozygosity are likely to exist, and that we have uncovered evidence for this process in planarians. We expect such mechanisms to be broadly distributed in multicellular organisms possessing long life spans, particularly in conditions in which mitosis drives the function and homeostasis of both somatic and germ cells. Indeed, our findings demonstrate that balanced heterozygosity is essential for zygotic development, but not for somatic viability in S. mediterranea suggesting that structural heterozygotes may be mechanistically associated with the robust regenerative capacity of planarians. On a personal note, genetics still had another surprise in store for me. After returning from Sardinia, I received notice that my own genome SNP analyses had been completed. Given that I am a true son of human migration, with both pre-Columbian and European ancestors, I had no idea what was waiting for me in that data. I found that I carry the Y-chromosome haplotype I2-M438. Sounds innocent enough. But as I began to look into it, imagine my reaction when I found out that haplotype I2-M438 is present in more than 40% of all males in Sardinia! Yes, Sardinia. Of all the places for my paternal lineage to originate from... So I wonder, when did our story really begin? August 31, 1999 with the arrival of our package, or sometime 28,000 years ago in Sardinia, when my paternal ancestors populated the island? I am not sure, but I cannot help thinking that genes are the ultimate time travelers, that haplotypes are their vessels, and that like all travelers across the history of our species, perhaps they too longed to visit their cradle one more time. We are grateful to all of the members of our laboratory, past and present, whose brain trust and rigor were instrumental in both helping us think about this problem, and in pushing us out of our comfort zones frequently. 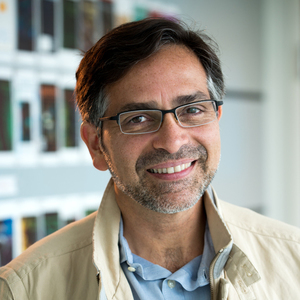 We are also indebted to the Planarian, Imaging and Sequencing Core facilities, and all of our dedicated colleagues at the Stowers Institute for Medical Research. Their combined efforts and dedication to science were instrumental for us to be able to carry out this research. Sánchez Alvarado, A. 2013. The freshwater planarian Schmidtea mediterranea: embryogenesis, stem cells and regeneration. Current Opinion in Genetics & Development, 13, 438–444. http://dx.doi.org/10.1016/S0959-437X(03)00082-0.